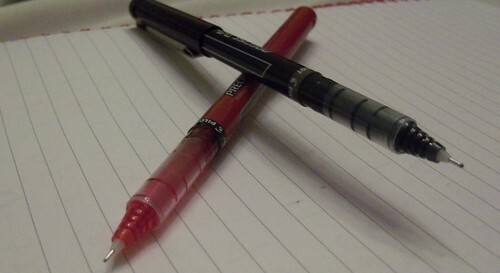 The Pilot Precise V5 and V7 have been two of my favorite pens since I was in the 4th grade. The Precise series of pens are actually one of the reasons I got interested in pens. Before I used this pen I didn't know there were different types of inks. I did a bit of research, trying to figure out why this pen wrote so much better than others, and was awakened to the wonders of high quality pens and office supplies. 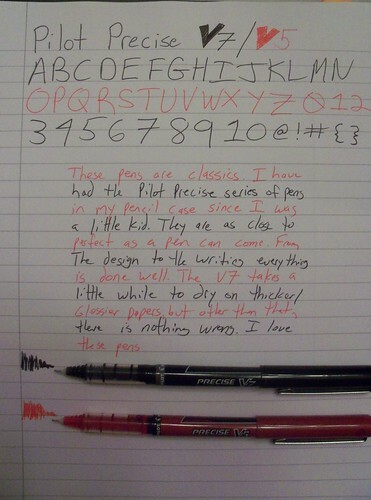 Even in the 4th grade I realized that the Pilot Precise was a step above the competition. Everything about this pen, from its design to its writing, screams quality. First, the writing. The Pilot Precise V5 and V7 are the 0.5mm and 0.7mm versions of the liquid ink Precise brand of pen. The V7 writes very fast and smooth. If you are writing on glossy paper it doesn't even feel like your writing, just gliding along the page. That being said if you have sloppy handwriting, like myself, it can get out of hand. On thinner and or cheaper papers there is show through. I have also heard of bleed through from these pens, although I have never experienced it. The V5 is also a super smooth writing machine, but is a bit more manageable. The super fine tip allows for a more controlled writing experience that is still just as smooth as the V7. It really is a masterpiece of a pen. Now onto the design of these pens. The Precise V5 and V7 are, in my opinion, some of the best looking pens out there. They have the name of the pen and the brand on the barrel and not much else. The cap is minimalist and fits snugly on the back, although I would like it if it posted with a satisfying click. The barrel has the name of the pen, the tip width, and is color coordinated with the ink color. My favorite feature of the pen is the ink window on the barrel which lets you see how much ink is left in the pen. As a kid I would always shake the pen until there were bubbles in the ink and then watch the bubbles move around instead of paying attention in class. Everything about this pen blends together perfectly into a great writing instrument that also looks good. The only possible negative is the needle tip of the pens. They are prone to be bending and damage. Even this happens rarely in my experiences. 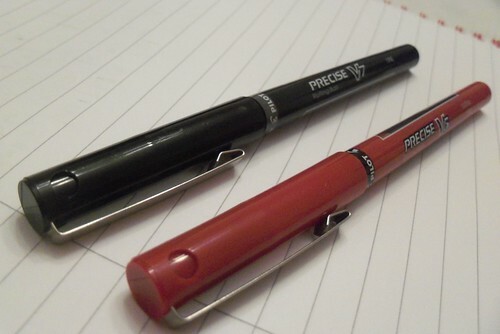 Overall the Pilot Precise V5 and V7 are two of the best pens made. 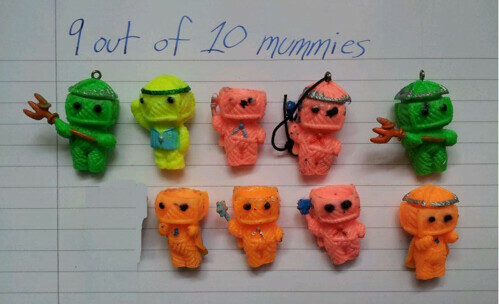 They deserve a spot in every person's pen case. Hey everyone. I smile when I say that the ONLY pen I have used in 27 YEARS is the Pilot V7. Always fine point. Mostly black, then equal Blue and Red. Not that lighter shade of blue that was out for a while! The 27 years have included 2 years of advanced science classes, leading to 5 years in dental school, preparing for two national boards exams, and a one year residency. Since that time I've been running a sales and marketing department for a small company, and the drawer hold ONLY V7s. Same 3 colors. If I had to guess... pre-dental through dental school is 184 months. At peak use I would dry up 3-4 pens in a month. Lighter times, only one or two. If the average per month is, say, 2.75 pens completely used per month, that's 506 Pilot Precise V7 pens from 1994-2002. 506! But ten years have since passed, and being a part-time writer and having a pen with me full time, I have maintained about 2 pens used each month. 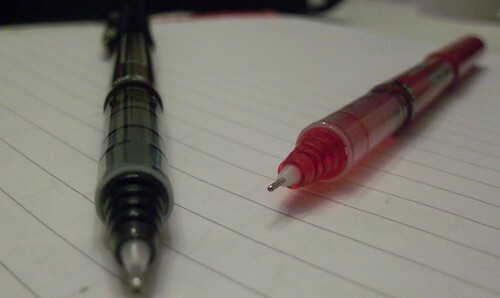 10 years=120monthsx2pens = 240 pens. 746 Pilot Precise V7 Fine Point Pens. Anyone know the cheapest place to buy a new dozen? I always forget. Ross- you can refill them. It's relatively easy to pull the tip off and pour in some ink. Nice review mate, I've been using the precise V5 for a little while now and overall am happy with the performance. Going to try out the V7 though!